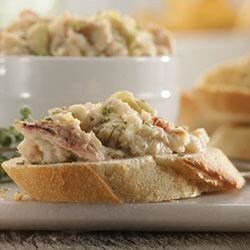 Buttery Crab and Artichoke Dip is a great, gourmet-style appetizer that is sure to turn heads at your gathering. This recipe melds our Roasted Garlic and Parmesan Baby Reds® potatoes with crab, artichoke and a variety of cheeses. Add all ingredients in a large mixing bowl and fold carefully. Use the water from the canned artichokes along with the boiling water. Place in a 9 x 12 baking dish that has been sprayed with olive oil. Bake until bubbling and golden brown. Serve with baguettes or crackers.